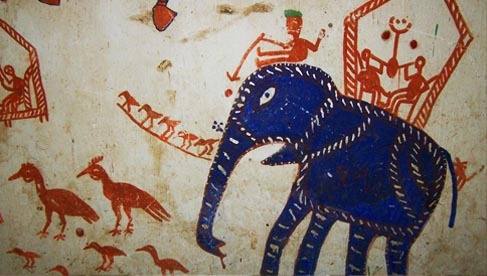 The Pithora paintings trail back long into history and find their roots in the cave paintings, thousands of years old. This is the most prevalent and characteristic art tradition of the Rathwa community, who live in the region bordering Gujarat and Madhya Pradesh states in India. 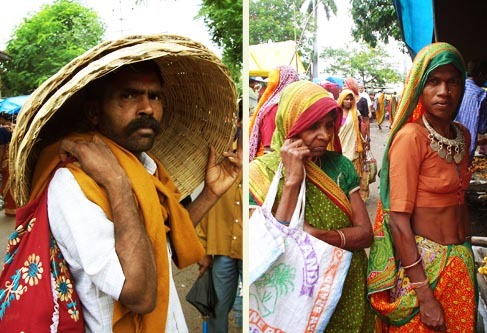 While the styles vary with every Bhil group, they hold a deep social relevance. 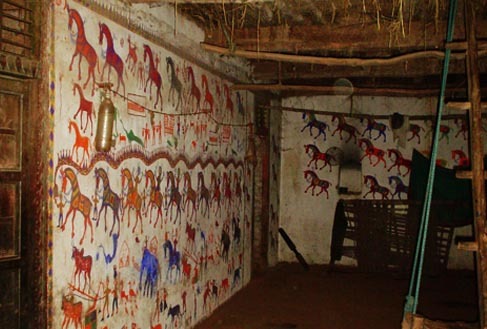 Pithora paintings are characterized by the seven horses representing the seven hills that surround the area where the Rathwas reside. This is enclosed within a rectangular fence in the painting that defines thisgeographical area. This rectangle usually extends up to the Arabian Sea in the west, Bharuch in south and Indore in north and east. The wavy line depicting the river Narmada cuts through the painting. Things like fields, trees, farms, wild life, birds, sun and moon are present in their relative positions in the map along with people and their ancestors. 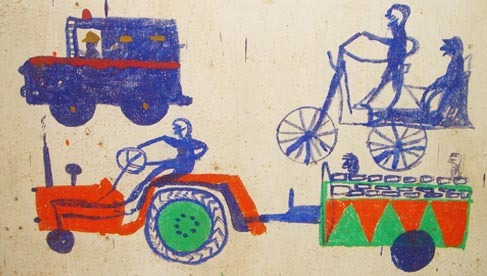 Even modern elements like railway tracks, aeroplanes, and computers feature in the paintings, thus making the Pithora paintings a real description of the world of Rathwa tribe. Pithora painting has various connotations. 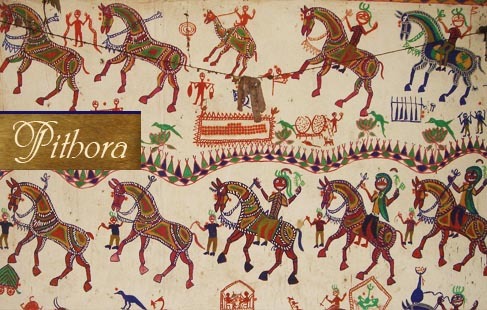 One meaning attached to the Pithora Paintings is the idea of a map. This tradition is supposed to have started in the 11th century, when Bharuch was a centre for traders from the North. The roads connecting Bharuch and nearby areas were difficult and even dangerous, so the tribes created a new profession for themselves – escorting Indian and foreign traders through this region in exchange for silver coins. To ensure that the area remains mysterious and their livelihood stays safe, the leader of the tribe made a map full of codes. Thus, the seven hills became represented by seven horses and the mouth of river Narmada by two tigers. The leader also ordered the escorts to make the same painting in their houses. The people who showed loyalty by painting the map at their home came to be known as “Rathwas” while those who disagreed, were called “Talavis”. The Rathwas then got rights to climb and dwell atop the seven hills. This practice went on till 1812 A.D. till the British rulers put a stop to it. Then the act of making Pithora painting became a ritual and Pithora became the god of Rathwa tribe. 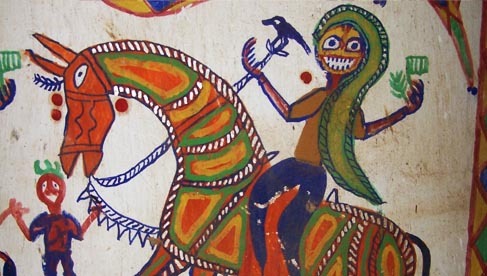 Pithora paintings are sometimes considered very sacred. The Rathwas consult the village Tantrik (witch doctor) to heal illnesses and undo bad omens. If a wish made to “Baba Pithora” is granted, a Pithora painting has to be made in the main wall of the house, in consultation with the Tantrik. It takes days to prepare for the final painting and the process and rules for the same are well defined. The wall is covered in cow dung or mud first and after prayers, the painting starts on a Tuesday and ends by Wednesday. The painting is made by Pithora painters, or “Lakhadas” and the family members residing in the house are not allowed to paint. The completion of the painting is accompanied with song, dance and celebration. There are at least 50 varieties of Pithoras with the smallest measuring one and a half feet and the largest 145×10 feet. Originally started as a code, became a sacred space and now being sold, although very infrequently, as pieces of art, the Pithora painting makers have managed to keep its essence and unique style alive while evolving with the changing environment. King of Gods, Raja Indra had seven sisters. 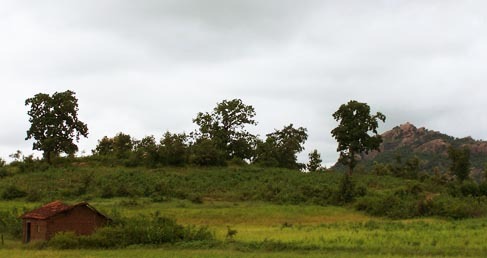 One day, one of his sisters, Rani Kadi Koyal went into the forest where she met Raja Kanjurana. She had an affair with him and after 9 months and 9 days, she gave birth to a son. Since she was still a maiden, out of fear of her brother, Raja Indra, she set the child afloat in a stream. That day Rani Kajal and Rani Makher (Indra’s other sisters) went to fetch water from the stream and found the baby crying. Rani Kajal fed milk of Akda / Banyan tree flower to the baby and bathed him with seven kinds of auspicious things. She named the baby “Pithora” and took him to the palace with her. As the time passed, Pithora grew into a fine boy. One day when he was playing, he broke Rani Kajal’s earthen pot. This made her angry and she scolded him saying, “As it is, your maternal uncle holds the share of entire kingdom…” She indirectly told him that Raja Indra is his maternal uncle. Hearing this, Pithora decided to find out who his parents are. He went to Raja Indra’s court and introduced himself. After hearing his story, King Indra accepted him in the family with great joy and decided to find a suitable bride for him. But Pithora needed to know about his parents, if he wished to be married. So Raja Indra invited a grand court. He invited everyone; all the gods and goddesses, kings and queens, noblemen and respected citizens. When Pithora came in the court, he pointed at Raja Kanjurana and identified him as his father. After much rejoicing, a grand wedding ceremony was arranged and Pithora wed Pithori with much aplomb. All the gods and goddesses attended the wedding. They arrived on horses and elephants. 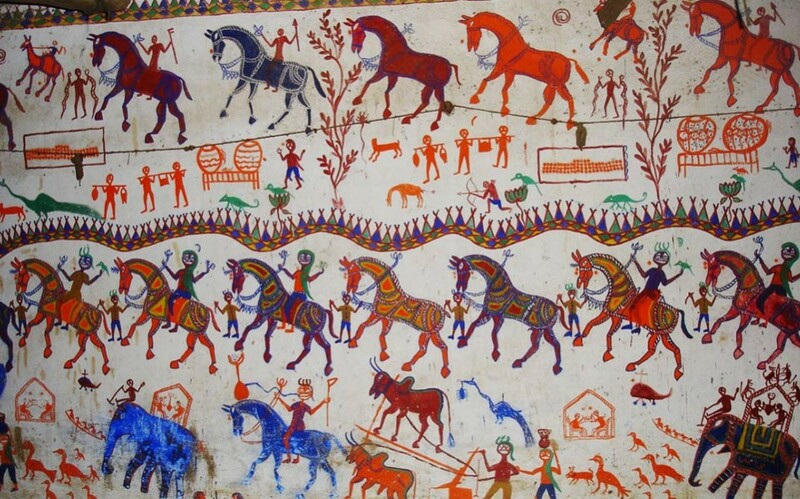 Hence Pithora painting hasgods arriving on horses along with Pithora and Pithori. Pithora is considered as god by Rathawa tribe because he identified his father right after seeing him for the first time. I came across your website while researching for my project work, really nice work. Thanks a lot!